Few events in American politics over the past two decades have generated more attention than the increasing number of voters calling themselves Independent. By the early 1970s Independents outnumbered Republicans, according to many eminent experts on voting behavior. Yet the authors of this incisive new commentary on American politics claim that most of this widespread speculation on declining party affiliation is simply wrong. They contend that most so-called Independents lean strongly toward one of the two parties and resemble—in all important respects—either Democrats or Republicans. Contrary to expert opinion, only a small segment of voters are truly "independent" of either major party. 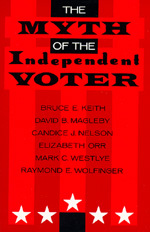 Based on the most up-to-date 1990 data, The Myth of the Independent Voter provides a roadmap of the political arena for the general reader and scholar alike. Debunking conventional wisdom about voting patterns and allaying recent concerns about electoral stability and possible third party movements, the authors uncover faulty polling practices that have resulted in a skewed sense of the American voting population. Demonstrating that most of what has been written about Independents for more than thirty years is myth, this challenging book offers a trenchant new understanding of the party system, voting behavior, and public opinion. Bruce Keith is an independent scholar in the Bay Area. David Magleby teaches Political Science at Brigham Young University. Candice Nelson teaches Political Science at The American University. Elizabeth Orr works for the city of Denver. Mark Westlye works for the Office of the President of the University of California. Raymond Wolfinger teaches Political Science at the University of California, Berkeley.